The desire to serve his country developed early in this Conservative rabbi, the Navy and Marine Corps’ highest-ranking Jewish chaplain. Not many bar mitzva boys know what they want to do with their lives. And among the list of glamorous possibilities—astronaut, professional basketball star, race-car driver—the rabbinate probably does not make the top 10. As for being a Jewish military chaplain, few 13-year-olds are probably even aware of the vocation. But Irving Elson, a 50-year-old Conservative rabbi and a captain in the Navy Chaplains Corps, has always been a little different. As the highest-ranking jewish chaplain in the Navy and Marine Corps, Elson’s sphere of influence extends far beyond individual servicemen. “Rabbi Elson is a senior officer who influences the entire [military] system,” says Rabbi Harold Robinson, director of the Jewish Chaplains Council and a retired rear admiral. “He is well-known and respected by senior military leadership because they know the quality of the source.” Indeed, Elson was called to the White House several times during one of his previous tours at the Naval Academy and was the only military rabbi to meet former President George W. Bush at one of those meetings. The ranks of Jewish chaplains have thinned out since the abolition of the draft in 1973, and there are now 30 active-duty chaplains and 30 reserve chaplains across all of the military services—about one-third of the Jewish chaplains corps population of the past. This crisis in Jewish chaplaincy means that fewer Jewish troops receive spiritually oriented resources, and fewer non-Jewish chaplains become educated about and sensitized to Jewish needs. According to rough Defense Department estimates, there are currently 4,000 Jews in all of the services combined. Elson was born in Mexico City—his father is an American Jew from Detroit and his mother is a Mexican Jew—and grew up attending Congregation Beth Israel, a Conservative synagogue. In 1978, he left Mexico to attend Yeshiva University in New York. Undergraduate studies were so fulfilling that he immediately continued with a rabbinical degree at the Jewish Theological Seminary; at the same time, he signed up for military reserve duty. He next volunteered for active duty, and in 1988, just two weeks after ordination, he and his wife, Fran, left for Okinawa, his first duty station. “I was going to serve for just three years at first,” Elson recalls. “But we had such a good time we kept saying ‘three more years.’” Now, after 23 years of active-duty service in places as varied as Japan; Charleston, South Carolina; Italy; Newport, Rhode Island; upstate New York; two tours at the United States Naval Academy in Annapolis, Maryland; and now in San Diego, “I don’t know of life not in the Navy,” he says. But the character of military service has changed in two decades, especially since the terrorist attacks of 9/11. 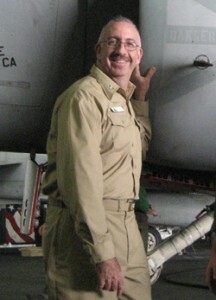 In August 2002, Elson was deployed to Kuwait and eventually Iraq for Operation Iraqi Freedom as the Marines’ only Jewish chaplain there, leading services under mortar fire and ministering to Jews and non-Jews in combat. In early 2003, Elson’s regiment came under heavy enemy fire in Nasiriyah and was ambushed by units of Iraq’s Republican Guards. During an intense firefight, Robert Page, the chaplain’s assistant assigned to him—essentially a bodyguard, since military chaplains do not carry weapons—covered Elson with his own body and returned fire, saving the rabbi’s life. Page was awarded the Navy and Marine Corps bronze star for his bravery. Elson has returned to combat zones in the Middle East and posts around the world since then, conducting services and Passover Seders, usually in a tent with a mobile Torah scroll, and overseeing the resources provided to Jewish sailors and marines, among many other duties. Fran and their three children—Jacob, 15, Aliza, 12 and Abigail, 6—are used to the idea of sharing him with the troops. But the pressures of serving during wartime test even the most committed military families. The chaplaincy’s unique role in the military continues to draw Elson in, regardless of the challenges of the historical moment. “The greatest success we have as chaplains is to prove that a spiritually or religiously centered young person makes a better sailor or marine,” he says. One particular benefit of a tenure as lengthy as Elson’s is that he has learned the most effective ways to promote progress. When he first arrived at the Naval Academy, for example, Jewish worship services during “plebe summer” (the period in which new recruits learn Navy ways) were held on Sunday mornings—simply because that had always been the traditional time for worship. It took him most of that year to change the time to Saturday morning, so that Jewish undergraduates could worship during Shabbat. Elson’s experience building bridges in the civilian community has also changed the landscape of Jewish worship. Starting in June 2005 as deputy command chaplain at the Naval Academy, he became instrumental in the building and dedication of the Uriah P. Levy Center and Jewish Chapel. Howard Pinskey, an Annapolis businessman who founded and is president of Friends of the Jewish Chapel (and is a 1962 graduate of the Naval Academy), worked with Elson to raise the $15 million for the building. Alison Buckholtz is the author of Standing By: The Making of an American Military Family in a Time of War (Tarcher;www.standingbybook.com).